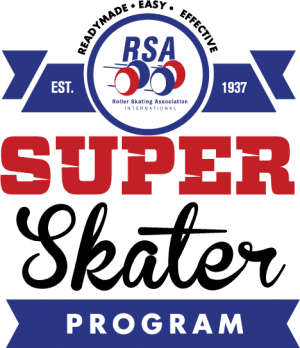 Super Skater pins may be purchased by the Rink owner/operator or RSA SRSTA coach prior to the Super Skater Test Center and presented on the spot to skaters who pass. Please contact the RSA Achievement Director, with any questions (317) 347-2626 or achievement@rollerskating.com. Forms are available from the national office or on the website at www.rollerskating.org. Super Skater How it WORKS for YOU! 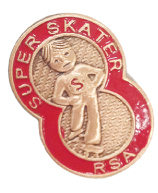 The skater must perform and pass any three of the five requirements to receive a RED level I award pin. The skater must stop within 10 feet without falling. In-line: The skater must skate continuously at a comfortable speed make an emergency stop in a straight line by raising the toe of one skate and applying his or her brake. Or the skater may use the traditional “T” stop. Quad: Have the skater point the toe-stop of his or her free skate toward the floor and then let it drag the surface. Or the skater may use the traditional "T" stop. Set up 10 cones, 10 feet apart along a straight line 100 feet long. The skater skates at a comfortable speed, weaving in and out of the cones without knocking them down. Skaters must perform one repetition in a circle. Use a figure circle or set up cones. Skaters must skate a distance of 50 feet, balancing from one skate to the other for a slow count of three on each skate. The skater will perform one pass under the limbo pole without falling or touching the bar. (The height of the bar or pole is to be positioned at the skater’s chest). 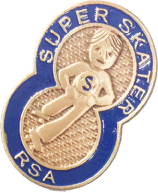 The skater must pass four of the six requirements to receive a BLUE Level II award pin and certificate. Skater does one sequence down or across the rink (six or more crossovers). Skater does one sequence across the rink. Skater must perform a two foot jump with a ½ turn revolution. Skater does any spin of two or more revolutions. Skater completes two laps around a speed track in 45 seconds or less. Skater must display a technical skill using the hockey stick.